lassoPlot(B) creates a trace plot of the values in B against the L1 norm of B.
lassoPlot(B,FitInfo) creates a plot with type depending on the data type of FitInfo and the value, if any, of the PlotType name-value pair. lassoPlot(B,FitInfo,Name,Value) creates a plot with additional options specified by one or more Name,Value pair arguments. [ax,figh] = lassoPlot(___), for any previous input syntax, returns a handle ax to the plot axis, and a handle figh to the figure window. 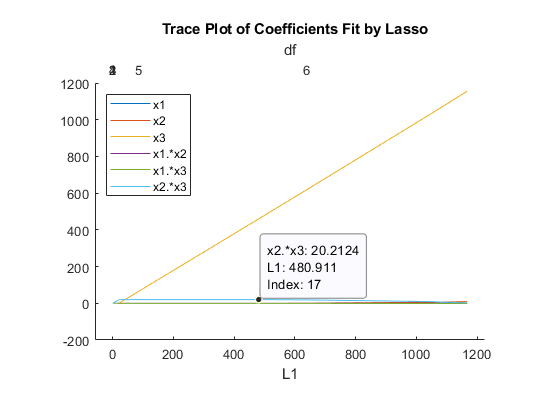 Coefficients of a sequence of regression fits, as returned from the lasso or lassoglm functions. B is a p-by-NLambda matrix, where p is the number of predictors, and each column of B is a set of coefficients lasso calculates using one Lambda penalty value. FitInfo is a structure, especially as returned from lasso or lassoglm — lassoPlot creates a plot based on the PlotType name-value pair. FitInfo is a vector — lassoPlot forms the x-axis of the plot from the values in FitInfo. The length of FitInfo must equal the number of columns of B.
Axis in which to draw the plot. 'L1' lassoPlot creates the x-axis from the L1 norm of the coefficients in B. The x-axis at the top of the plot contains the degrees of freedom (df), meaning the number of nonzero coefficients of B. When you choose this value, FitInfo must be a structure. lassoPlot creates the x-axis from the Lambda field of FitInfo. The x-axis at the top of the plot contains the degrees of freedom (df), meaning the number of nonzero coefficients of B. When you choose this value, FitInfo must be a cross-validated structure. 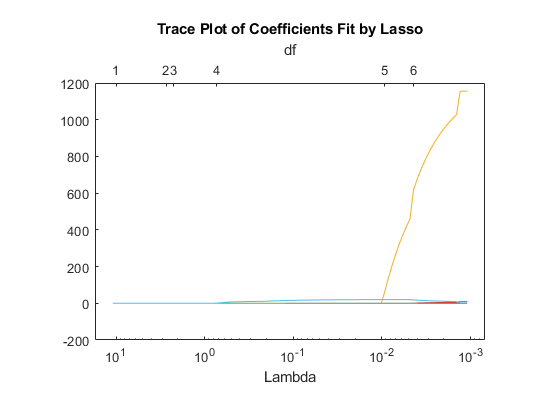 For each Lambda, lassoPlot plots an estimate of the mean squared prediction error on new data for the model fitted by lasso with that value of Lambda. lassoPlot plots error bars for the estimates. If you include a cross-validated FitInfo structure, lassoPlot also indicates two specific Lambda values with green and blue dashed lines. A green, dashed line indicates the value of Lambda with a minimum cross-validated mean squared error (MSE). A blue, dashed line indicates the greatest Lambda that is within one standard error of the minimum MSE. This Lambda value makes the sparsest model with relatively low MSE. To display the label for each plot in the legend of the figure, type legend('show') in the Command Window. String array or cell array of character vectors to label each coefficient of B. If the length of PredictorNames is less than the number of rows of B, the remaining labels are padded with default values. You created FitInfo with a call to lasso that included a PredictorNames name-value pair. You call lassoPlot without a PredictorNames name-value pair. You include FitInfo in your lassoPlot call. For an example, see Lasso Plot with Default Plot Type. Handle to the axis of the plot (see Axes Appearance (MATLAB)). Handle to the figure window (see Special Object Identifiers (MATLAB)). Prepare the design matrix for lasso fit with interactions. Fit a regularized model of the data using lasso. 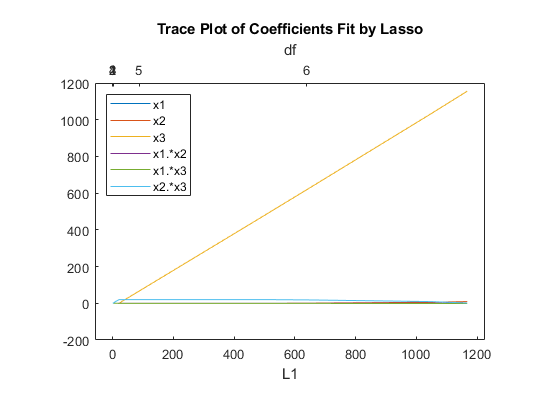 Plot the lasso fits with labeled coefficients by using the PredictorNames name-value pair. Each line represents a trace of the values in B for a single predictor variable: x1, x2, x3, x1. *x2, x1. *x3, and x2.*x3. 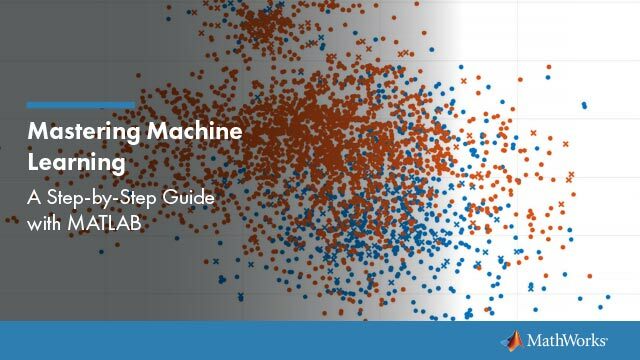 Display a data tip for the trace plot. A data tip appears when you hover over a data tip. A data tip displays these lines of information: the name of the selected coefficient with a fitted value, the L1 norm of a set of coefficients including the selected coefficient, and the index of the corresponding Lambda. Prepare the data for lasso fit with interactions. Fit a regularized model of the data with lasso. Plot the fits with the Lambda plot type and logarithmic scaling. Visually examine the cross-validated error of various levels of regularization. Create a design matrix with interactions and no constant term. 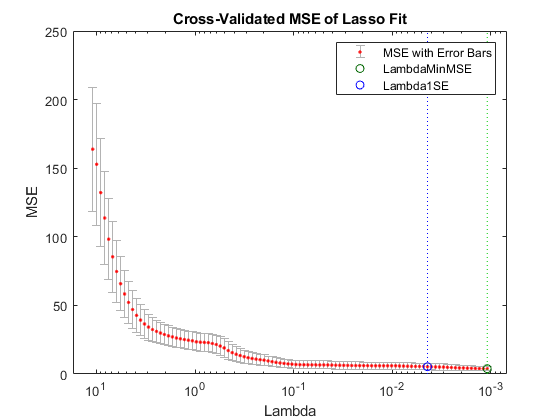 Construct the lasso fit using 10-fold cross-validation. Include the FitInfo output so you can plot the result. The green circle and dotted line locate the Lambda with minimum cross-validation error. The blue circle and dotted line locate the point with minimum cross-validation error plus one standard deviation.